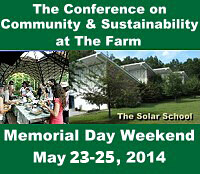 The Farm Communities Conference 2014 — Register Now! These elements form the essential Building Blocks of Community, the components within the gestalt of living together, producing a whole greater than the sum of its parts. , both released in April of this year. In looking back at my 40+ years with The Farm, I am now more convinced than ever that life in community offers the most effective means of leveraging your ideals, the toolbox that allows you to create real change in the world. And now more than ever, the world needs intentional communities to stand out as visible models, real examples of how people can live together in harmony with each other and with nature. Join me and others from coast to coast as we explore the power and potential of community during this dynamic and incredibly fun filled weekend. As a special thanks to everyone who will be attending this year’s conference, I am giving each person who registers a signed copy of Out to Change the World. I hope it will inspire you to live your dreams, and to take the next step in building for yourself, a sustainable life. Visit Our Web Site to Learn More and Register Today.Contact me with any question you may have. I look forward to hearing from you! Our sixth conference in partnership with the Fellowship For Intentional Community.